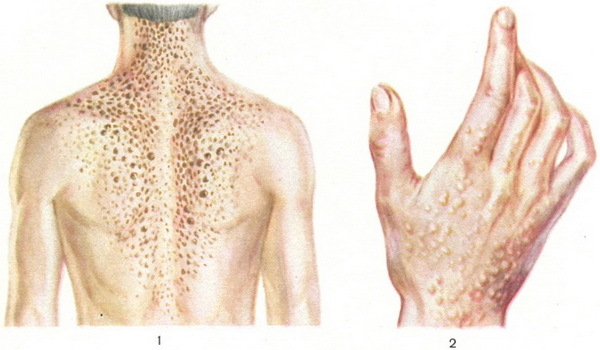 Daria disease (synonym follicular diskeratoz) is a chronic, relatively rare skin disease characterized by the emergence of a cone-shaped nodules value from 2 to 5 mm in diameter, yellow-brown or brown. Nodules are associated most often with hair follicles, their surface is covered with dense yellowish-dirty color crusts, during forcible exclusion which significantly impression. The elements are focal or symmetrically prone to plaque formation, covered horn masses. The preferential localization: the scalp, neck, face (region naso-lip folds), interscapular space, armpits, folds Breasts, buttocks, PAHO-femoral folds, the backs of the hands and feet. Lesions are sometimes type of wart or callus with a depression in the center. On the adjoining areas of the skin elements often form plaques with fetid weeping. Fig. 1. Nodular lesions on his back. Fig. 2. Rash resembling plane warts. Rare disease Darya are the gallbladder and hypertrophic forms. When illness Daria may experience the following symptoms: premature graying, hyperpigmentation hair for elderly people, dystrophy teeth, change the nail plate, which are opaque and streaked lengthwise whitish grooves; dementia; endocrine disorders, etc. The disease occurs normally in the age of 10-15 years, but sometimes get sick and children in the first years of life. The cause of the illness Daria not clear. In many cases it is family, hereditary character. In the pathogenesis of the disease Daria assign a role dysfunction sexual glands, deficiency of vitamin A. Some improvement can be obtained by systematically using vitamin a to 150 000 ME in the day corresponding to the hormones in the endocrine pathology, the diathermocoagulation separate entities, rubbing 2-5% sulfur, salicylic ointments, sulfide baths (the best in the resort).